HTML5 Events Calendar is distributed as an Adobe Dreamweaver extension, packed as a file, named JQEventsCalendar.mxp. Read more in the online help. Our simple to use yet great looking HTML5 Events Calendar will allow you to create a calendar for any website where you can publish events, periods or just notes are easy to insert and what is more important attractive to the eye. Calendar highlights current day, other events can be marked with different background and hover colors, captions, floating tips and even icons. You can add any HTML code as an event description, including links and images to make it more vivid! Choose date format and set Monday or Sunday as the first entry of week rows. The installation package contains Dreamweaver extension, providing you the ability to easily create the high-impact, XML-powered Events Calendar, all in Dreamweaver CS3, CS4, CS5, CS6, CC 2014, 2015, 2017 and CC 2018. 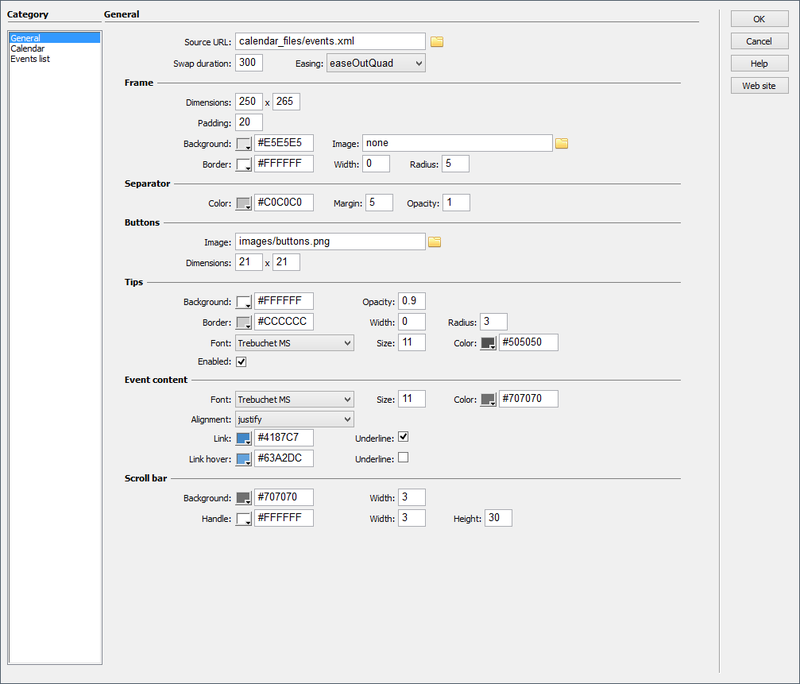 Using the user-friendly interface, you are provided absolute control of all colors, fonts, sizes, spacing, etc. Keep you visitors updated with all events happening in your website in a convenient manner or use it as an organizer of your personal schedule! There is no need to dig into CSS files to make some changes in calendar style. All colors, fonts, sizes, spacings and other - can be changed to fit the look and feel you want with few clicks. You can easily create necessary list of events, using events editor. Through the events editor you can add or remove events and write description. Calendar has different animation effects for day highlight and day swap. It is possible to add HTML code as an event description. Each event can be higlighted with its own background and hover color. Also calendar highlights current day. Each event can have its own icon with alignment parameter. Each event can have its own caption with alignment parameter. Each event can have its own floating tip. Installation package contains Dreamweaver extension. 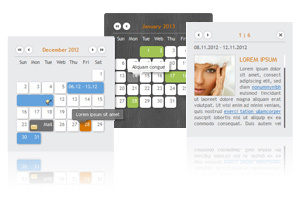 Dreamweaver extension allows you to easily create HTML5 Events Calendars. Extension has user friendly interface.